We love a good cliché and to stereotype the wine potential of a country. 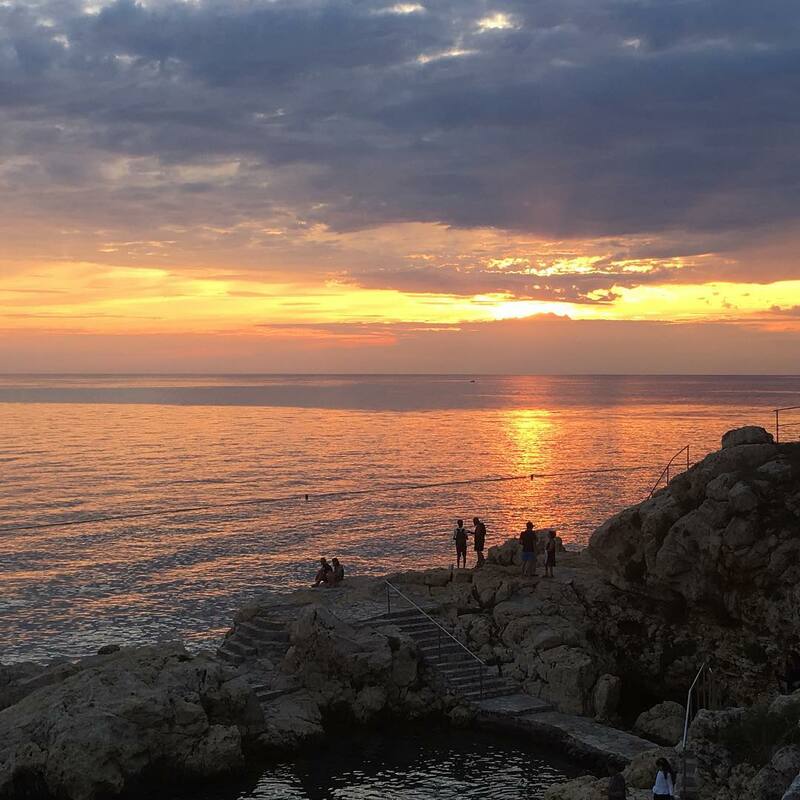 When you think of Croatia you imagine the grand sweep of the Med from Istria to the Dalmatian coast, its turquoise seas studded with islands, the picturesque villages with gaily-painted houses and bustling waterfronts perched under thickly forested mountains. And you can imagine drinking delicious earthy wine with the fantastic produce that comes from the teeming seas and forests. Why wouldn’t it be that way? The truth is somewhat more prosaic. For all the good-looking terroir and ideal growing conditions there seems to be a dearth of delicious wine. In fact, there is very little evidence of an organic farming approach or an inquisitive wine culture. And then there is Piquentum. This is a tale of a son of a Frenchwoman and an Istrian father, growing native Croatian grapes and making wine in an old Mussolini-era concrete water tank. Born in French Basque Country (Jurançon) in the foothills of the Pyrenees, Dimitri Brecevic studied oenology in France and then worked at Domaine de Chevalier in addition to working harvests in Australia, New Zealand, Bordeaux, and Burgundy. In 2004 he decided to invest himself in his father’s homeland of Istria near the town of Buzet. 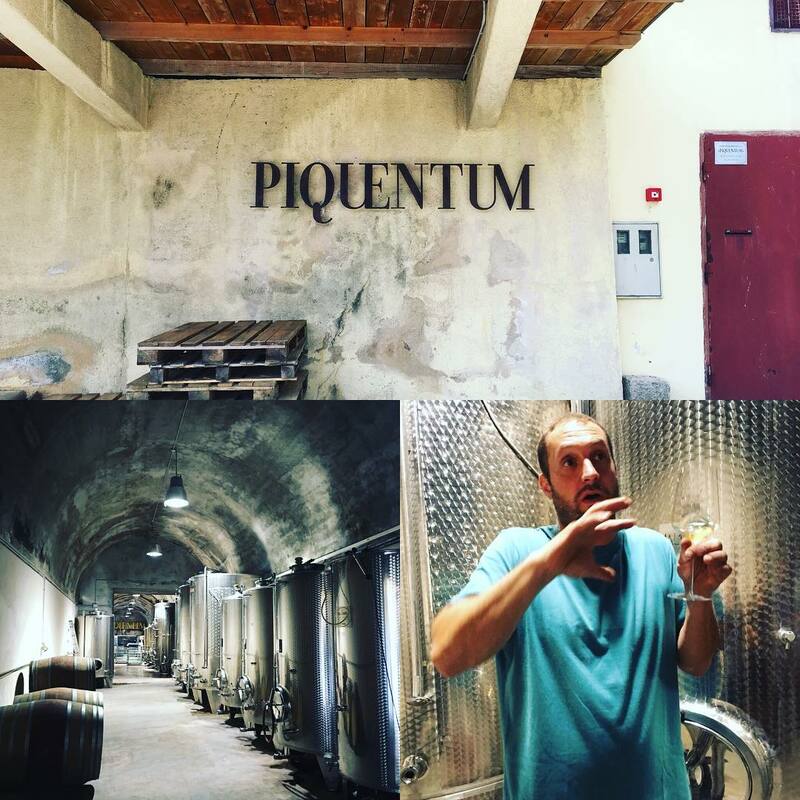 The name “Piquentum” is the ancient Roman word for the beautiful hilltop town of Buzet. Dimitri’s arrival falls right in line with the regions long history of Romans, Goths, Franks, and Bavarians. The Republic of Venice even had a solid 500+ year run. And although briefly a part of the Austro-Hungarian Empire until the World Wars, it was briefly once again a Province of Italy until 1947 when Yugoslavia was created and Italy ceded the territory. Istria is also the largest peninsula in the Adriatic, Croatia’s westernmost region, and borders both Italy and Slovenia. With only about 1750 square miles, over 280 miles are coastline with 35% covered with oak and pine forests. Indigenous grapes like Malvazija Istarska and Teran coupled with the mineral rich white and red karst soil all seem to echo the salinity of this pristine coastline and the pungency of its truffle-ridden interior. The climate, red and white soils, everything in Istria is perfect for quality viticulture. Istria is the northern edge of Mediterranean, and in the winter, it can be very cold when the strong bura wind comes from the north. In September, when usually vintage takes place, it is chilly during the night and this helps to maintain nice acidity and aromas in the grapes. The most significant white grape is the Istrian Malvasia, which occupies approximately two thirds of the entire grapevine plantations extending over this area. The most typical red grapes are Teran, and its curious relative – Refošk (more about these below). With currently 4.5 ha of vineyards: Malvasia 60%, Teran 20%, Refosco 20%, Dimitri’s goal is to keep competition high, work the land by hand, and get roots penetrating deeper and deeper into the alternating ferrous-rich red (terra rossa) and white flysch soils that define Istrian terroir. Grapes are hand-picked and then slowly pressed into tank without temperature control. All of Dimitri’s wines complete a wild ferment without the use of added yeast, bacteria, enzymes, or any additives. After a long and slow fermentation without stalling fermentation or cold soaks, the wines are bottled unfiltered with just enough sulphur. In contrast to the iron rich red soil of Terzolo, Štoka, and Coronica, the grapes for the Malvazija Blanc are planted in the predominately flysch-rich white soil unique to Istria. The wine was then fermented in stainless steel after 6-8 days on the skins resulting in a wonderfully fine-grained texture and deep straw yellow colour. Dimitri tells us that it is almost impossible to make a Malvazija without some sort of skin contact, owing to the nature of the grapes. There is also an old vines version where Dimitri sources the grapes from an old woman. From 80 year old vines grown on bauxite over limestone, this is matured for three years in 500 litre barrels and bottled with minimal sulphur. Super mineral intensity. 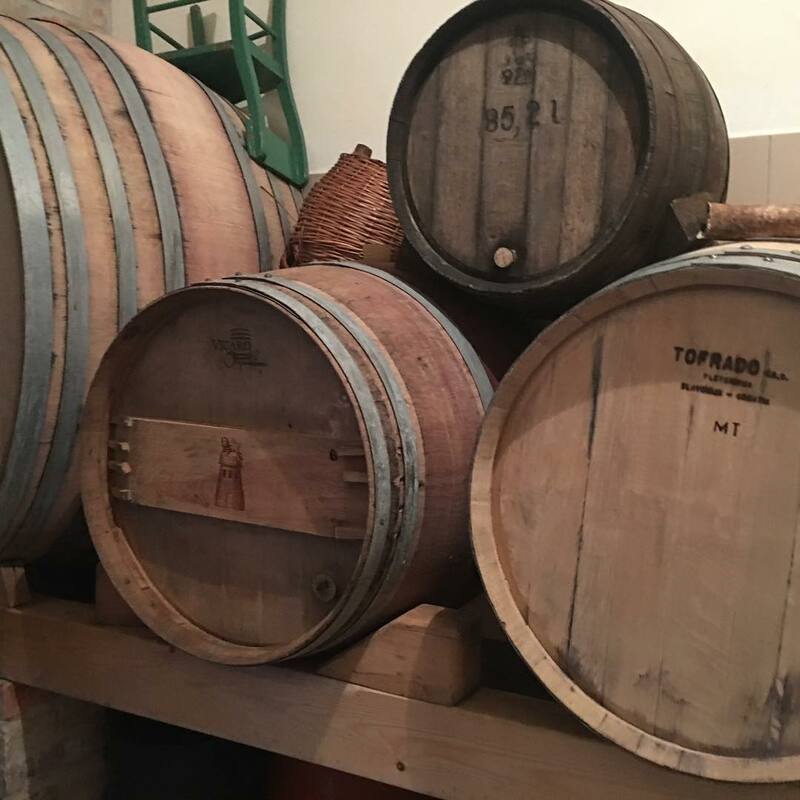 The Teran, meanwhile, is destemmed, undergoes a 20 day maceration and spontaneous fermentation and natural malolactic fermentation, is aged in wood (225 and 500 litre used barrels) from 14 to 18 months and bottled without filtration. This wine has the remarkable ability to be incredibly fragrant and coat the inside of the glass like syrup, while still being a light bodied, low alcohol wine with acidity. Primary and malolactic fermentation are completely with native yeasts. While Teran is in the Refosco (& Refošk) family, it differs in that it has slightly higher acidity and pronounced iron and sanguine flavours. Historically, in Istria, Teran was given to woman after childbirth to combat anaemia due to the rich iron content. In Istria we consider that we have two different varieties, regardless of the soil. Now, it is complicated by the fact that there are a lot of different clones of Teran and also of Refosk, and that some of them are really similar…But the two most common in Istria “Istarski Teran” (inerea teran) and “Refosk crvena peteljka” (refosco pedonculo rosso), are completely different and you can taste that in my wines. The Teran has low alcohol, high acidity, spicy aromas, and distinctive peppery notes. The grape is sensitive in the vineyard, both to strong sun (burn) and also to humidity (botrytis). Refosk (pedonculo rosso), conversely, often has high alcohol, low acidity, displaying fruity and chocolate aromas. Easier to cultivate, but sensitive to oidium. The wines are understated; Dimitri is not seeking aromatic or varietal expression, but something more complete and textural. 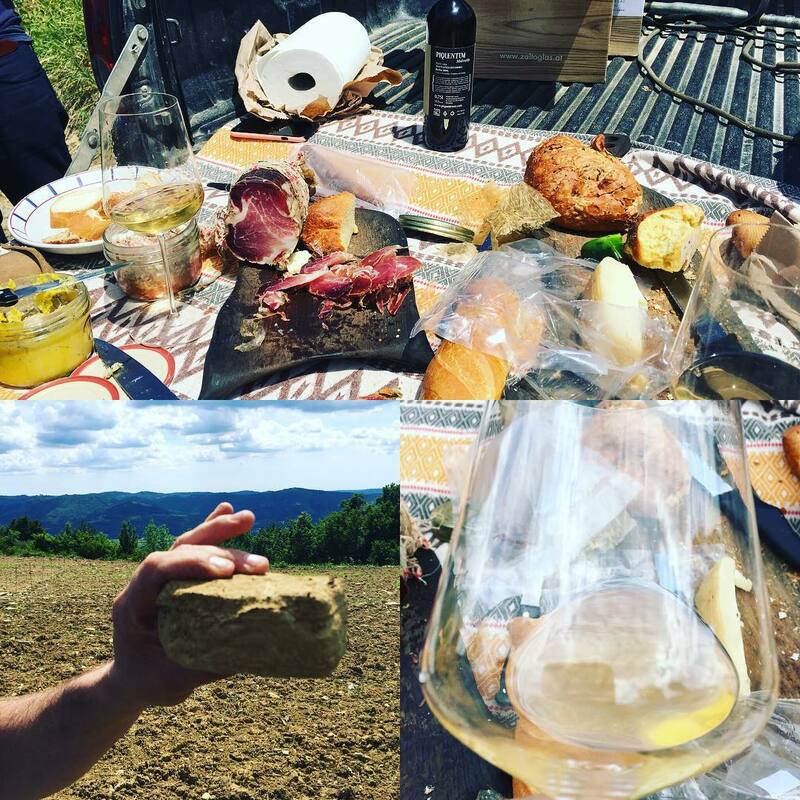 Other: we enjoyed a picnic overlooking a newly-planted vineyards of all things French, foie gras from Gascony, ham, sausage, a variety of loaves, and a freshly caught local cucumber or two to assuage our pork-lined guilt. Malvazija and Refosk were guzzled alongside the fatty scram. We then drove down to the coast and visited the cellar of a small biodynamic grower (although said grower is himself lanky and tall) who works under the label called Makino. At this point I was suffering from a mixture of lack of sleep and pork overload and effectively zoned out, but I did register that we were in perhaps the smallest winery that might be termed such. One modest tank and two small barrels. When I posted this claim on Instagram various people volunteered that they had visited smaller wineries, ones you might conceivably fit inside a cardboard box, or one made of spit and sawdust without either the spit, or indeed the sawdust. Dimitri took us to the yacht-plastered marina of Rovinj. The bay was lined with innumerable restaurants and bistros purveying identikit pizza, pasta, steak and fried scampi. Thousands of people were sitting outside and tucking into this tourist fodder washed down with beer or coke, thousands more were promenading through the streets and admiring the glorious sunset which was staining the sea. Before you could say bougainvillea, we were seated around a rustic wooden table devouring sea bass crudo and ricotta (#whoknew), risotto, fried squid, all cooked in the home kitchen of a local fisherman. Stay tuned for Part Two: Slovenia!